As the captain of the Republic of Ireland football team it was Roy Keane's responsibility to lead the players on the pitch. It was also his responsibility to represent them and their views off the pitch to the Irish soccer manager, Mick McCarthy. In terms of the former Keane was peerless. His leadership on the field was never in question. Keane's performances for the Republic of Ireland on the pitch, particularly during the qualifiers for the 2002 World Cup, were superb. In the context of the latter it appears that Keane's relationship with Mick McCarthy meant that he was unable to perform a captain's role off the soccer pitch. This is ultimately what led to the Saipan Incident. For whatever reason it is now clear that Roy Keane would not communicate directly with Mick McCarthy and nor did he easily relate to any of the members of the Irish squad. When Denis Irwin finished his Irish international playing career Roy Keane became the only player to room by himself. When asked in the Paul Kimmage Interview in Saipan which players was he closest to, he replied "None of them, but that's been the case for many a year...". His aloofness made him unapproachable by the other players and he eschewed any contact with Irish team manager Mick McCarthy. This is hardly an ideal situation and is difficult to understand as Roy Keane is an intelligent and articulate man. As was shown on many occasions Keane had no problems communicating with and through the media. In a telling passage in his autobiography Keane clearly demonstrates that lack of communication between the Mick McCarthy and himself. McCarthy had been appointed as manager of the Republic of Ireland soccer team in February 1996. 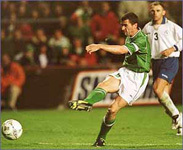 In his first match as captain, and with McCarthy as Irish manager, Roy Keane was sent off for kicking a Russian opponent at Lansdowne Road (now the Aviva Stadium) in March 1996. He missed the next four matches, all friendlies, for the Republic and when he was called up for the US Cup in June he withdrew citing tiredness after a long hard Premiership season. Keane did not speak directly with McCarthy. Keane takes up the tale from here; "He felt I should have spoken to him personally. He expressed this opinion, casting me in a bad light. What he didn't tell the media was if we had that sort of conversation, it would have been our first. "[Page 247]. It was not unreasonable for the Irish manager to expect that his captain to pay him the courtesy of a phone call and to have direct one-to-one communication. Keane used Mick Byrne to relay messages to his international manager and he admitted as much in his interview with Tom Humphries in Saipan "I spoke to Mick Byrne, who's the middle man for me, really." In McCarthy's Word Cup diary [Page 134] he details the circumstances surrounding Roy Keane's absence from Niall Quinn's testimonial football match in May 2002 just before departure for the 2002 World Cup. Someone from Manchester United had contacted McCarthy to tell him that Keane wouldn't make the match as he had to travel to France for treatment on an injury. "Roy has not called me to confirm this personally but I have no problem with his method of communication via the club." Clearly this was not a normal or healthy means of communication between the Irish football manager and the team captain. With the benefit of hindsight, this situation was a recipe for disaster in the future and was symptomatic of a deeper problem between the two men. Another example of Keane's unwillingness to speak directly to Mick McCarthy and an early instance of Keane's use of the media to relay messages, was after the Republic of Ireland had played Iceland in a 1998 World Cup qualifier in Reykjavik. In a Sunday Independent interview Roy Keane legitimately complained that it was unacceptable the the FAI officials were seated in first class while the players were consigned to economy class. He also complained about the standard of the Irish training facilities in Clonshaugh. McCarthy agreed that, as Republic of Ireland captain, Keane had a right to air his views on such matters but "Perhaps he would be better served bringing these issues up with me and the FAI before running to the papers..." [McCarthy's World Cup Diary - Page 53]. There was an echo of this in Saipan six years later. When Roy Keane announced to McCarthy that he was leaving the Irish set up in Saipan McCarthy asked Keane what was the problem. Was it training? Was the pitch? Was McCarthy himself the problem? Keane answered; "No it's just me, I've had enough...tell them [the press] ... personal problems." [Keane's autobiography - Page 259]. Here is Keane face to face with McCarthy and yet he can't prolong the conversation long enough to actually speak his mind and he lets McCarthy believe that Keane's problems are of a personal nature. When questioned in media frenzy that surrounded the rumours that Keane had quit the squad, McCarthy confirmed that Keane had decided to go home due to personal reasons (as agreed with Keane) but had now changed his mind. Then after Keane decided to stay he conducted two interviews with the press - Tom Humphries of the Irish Times and Paul Kimmage of the Sunday Independent - in which he detailed all of the issues that were bothering him about the Republic of Ireland set up in Saipan. This undermined Mick McCarthy's credibility especially since McCarthy had peddled Keane's line - personal problems - to the press earlier. This is further evidence that Keane was not able to deal directly with McCarthy yet he was articulate enough to communicate his views and opinions through the media. Eventually Keane confirmed what most people had suspected soon after Mick McCarthy had been appointed as the Irish football manager. Roy Keane did not respect his manager. According to McCarthy's book [Page 176] Keane admitted, during his rant at the infamous team meeting in Saipan, that "he missed friendlies because he didn't want to play for me...he used to join the squad late for games to avoid me for an extra day or two." What is amazing is that Keane's lack of ability to perform the off-field aspect of his duties as Irish team captain did not lead to a major bust-up with Mick McCarthy before the Saipan affair. It is perhaps with the benefit of hindsight, but it is now clear that Mick McCarthy made a major error by not choosing a squad captain and a playing captain. Clearly he was right to make Roy Keane his captain on the football pitch. But it seems obvious that the last person that should represent the players' interests is someone that the other players find unapproachable and that could not tolerate direct contact with his manager. Roy Keane is culpable because he should have demonstrated more maturity in his dealings with McCarthy. The Republic of Ireland manager is even more culpable because he tolerated a situation where he and his team captain had minimal direct contact. As manager it was McCarthy's responsibility to deal with this issue at an early stage in their relationship. He didn't and thus he unwittingly encouraged a pattern whereby Keane used the media to convey his messages to McCarthy that ultimately led to the Saipan incident.